I’ve had a few DM’s on IG stories about how I created my Instagram Highlight covers, so today I’m sharing a quick step by step tutorial so you can easily make your own! I promise it’s super easy to do. 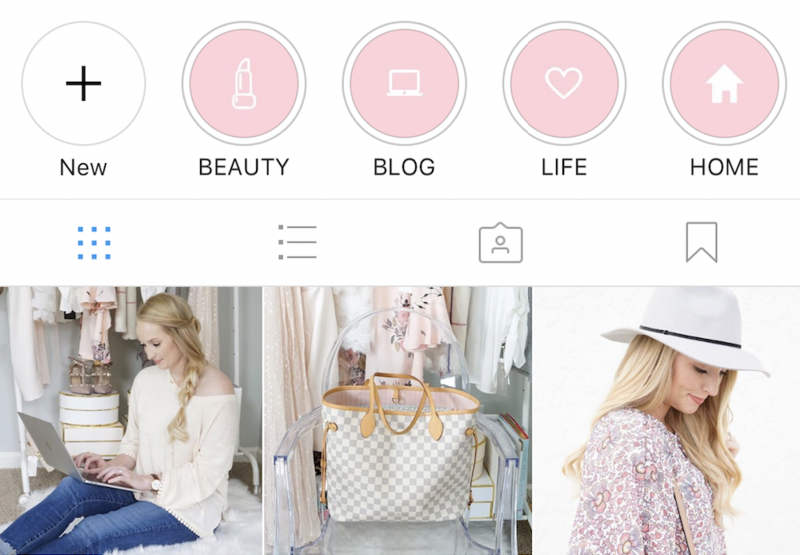 Why should you create pretty Instagram highlight covers? Well if you’re anything like me, pretty things make you happy. 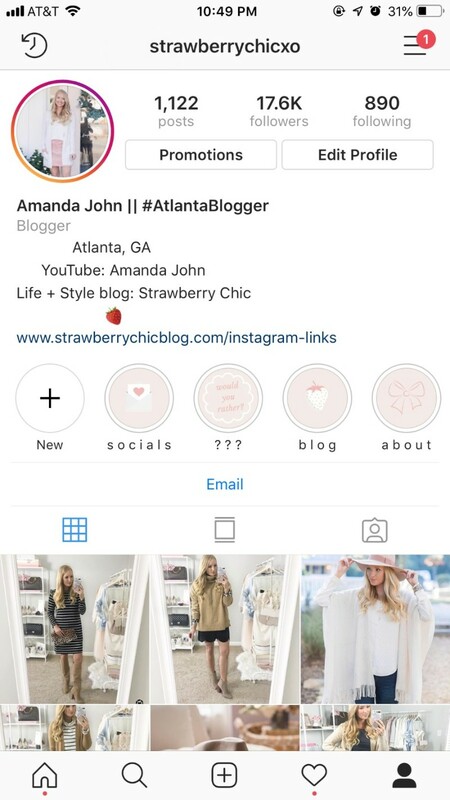 Little details like a cohesive feed and matching Instagram story highlight will make your profile stand out! Save yourself the $10-20 I’ve seen people charge and give this tutorial a try first. If you want to see how to grow an authentic Instagram following don’t miss this post. Go to Canva and click on create a design. I find Canva works better in Chrome verse Safari if you’re on a Mac. Click on backgrounds and select a color or background of choice. You can customize the color by clicking the [+] box. You can also upload any picture if you want to use a styled background instead of a solid color. Get creative here, but you want to make sure they aren’t too busy and easy for people to read. Search the icons you want to use for the highlight covers you plan to add to your profile. My highlight covers are beauty, style, life, home, bloopers, and blog. I picked cute simple icons that went with these topics. Drag the icon to the center of the post. Canva helps you align things easily! You can also change the color of the simple images to match your style. Again, I choose white. Try to keep the icons a similar size when adjusting them. I kept the same template for each highlight cover and just changed the title and image after saving it to save some time and make sure it was cohesive, but you can create individual graphics if you’d like to spend the extra time doing so. Some tips, try to keep the icons a similar size when adjusting them. You’re one step closer to having Instagram highlight covers! Now that you’ve made Instagram highlight covers to use, it’s time to add them to your Instagram Highlights! I uploaded the graphics to my dropbox, then saved them on my phone. There are multiple ways to transfer graphics from your computer to your phone, but Dropbox is the method I like to use. For now, the only way to add to your Instagram highlights is by uploading them through your stories, so upload each graphic you plan to use and share them on your story. I gave my followers a heads up prior to doing this so they weren’t completely confused about the random graphics. Now you’re ready to make them your highlight covers. Click [+] NEW on your Instagram profile page. This is right under your bio. UPDATE: I’ve had a few questions about how to get the IG highlight cover before certain stories. As of now, they will only show up in the order they were posted (chronologically). If you want to include older IG stories to a newer highlight, then you will have to re-upload them to your stories after you post the cover. Click edit cover and align the icon how you want it to show as the cover. Then type in the title and click add in the top right corner. Boom, you now have pretty Instagram highlight covers. Just repeat these steps to add all of your topics you want to include on your page. MAJOR UPDATE! You can add a highlight cover without uploading it to your stories. Click edit cover and scroll to the LEFT and you will be able to upload a photo from your iPhone. YAY! I would love to see your new Instagram highlight cover creations! Tag me in your stories and share this tutorial with your friends so we can all have pretty IG story feeds. You can see how I edit Instagram photos in my new Edit of the Week series! This was such a great tutorial–so easy to follow your steps. Thank you for sharing! Thank you so much for sharing this great post! blog graphic option anywhere? Is this feature only available if you pay for the upgrade? I use the free membership so I don’t think so! It’s under my recommended designs when I click “create a design” on the left side of the page. Try looking through the different size options under the social media post or the blogging graphic sections, but if you can’t find it I’m sure you can also use the Pinterest Graphic design, too! You want the image to be something taller than wider to fit on IG stories nicely. Thank you so much, the Pinterest graphic worked great! BEST tutorial…you saved my life I was getting so frustrated!!!! THANK YOU! Hi, Where do you find the cute images for your icons highlights? You can search for images at the top of the category under elements –> shapes. I searched beauty for example and found the lipstick image! You can also change the color of the image if needed. This was an amazing tutorial! I have created all of my covers and downloaded as jpgs, but the downloads are showing up in my finder (on mac) as text edited documents and not .jpgs. I can’t seem to get them to my phone. Not sure if this is just happening to me. Any tips? Hmm, let’s try to figure it out! My first thought is to download the Canva app and see if your images show up there for you to save to your phone. Click the image then “share” in the top right corner then after a few seconds the typical iPhone menu popped up with the option to save the image. Let me know if that works! I’ve done it and it worked awesome so thankyou! Now how do ou delete them from each section without deleteing the cover? Every time I take the picture away the cover goes away too. Even after 24hrs of being in my stories. Help please! Never mind I finally figured it out on my own! What was the fix for this? Unfortunately, I can’t figure it out! I’m not 100% on the question because I haven’t had that issue myself, but I will try to help! Are you trying to delete a IG story frame from your highlight? Hi! Do you know how to have the cover photo show up first when people click into the stories? It shows up in chronological order! So if you want older posts to go after the cover you have to re-upload them. Re-upload? Pardon my ignorance, but how do I do that? Hi! What exactly do you mean by “Be careful to click on them in order!”? I was noticing in your “Life” story the card comes 3rd, whereas the others have the card 1st. How do you make sure the card is always first so they’re all consistent? Hey! When I first wrote the post I assumed you can click them in the order you wanted them to show. However, stories will only show up in the order they were originally posted. My life story cover shows up third because I added older stories to that highlight. To have the cover first, I would have to re-upload some of the stories to show up after the newer cover. I hope that makes sense and I just updated the post to clarify! Thank you so much for this quick tutorial! Completely obsessed with mine now! You’re the best! Yay! Glad it could help you out! What do you mean by ”blog graphic”. I can’t find it. Please help me. When you click “create a design” Canva gives you the option to click what size post you want based on where you’re sharing. In this tutorial, I used the one called “blog graphic”. I’m sure you can use other designs that are longer than they are wider (like the pinterest or tumblr graphics) as well if you can’t find the blog graphic option. I’m not exactly sure on your question, but I hope this helps! You upload your stories like you normally would, then to add them to a highlight you want you go to your profile and click either “new” to create a new highlight or click on an existing highlight and in the bottom right corner click “more” then click edit highlight. Then add the stories you want to that highlight and you’re done! Try to search for “blog graphic” on Canva in the top right corner. If you can’t find it, you can use the Pinterest graphic instead! You just need to choose a template that has a vertical orientation for stories. How do you find elements?? If you’re on a desktop, it should be on the far left side under layouts! I just finished uploading all of the icons to my instagram. The only problem I am having is arranging the order in which they are seen on my page. Is there a way to arrange them? Right now they show up in the order you update them! Thank you for the tutorial. Finally have some clean, professional, cover images! Where is “blog graphic” option? Are you using your phone or computer? If you’re using your phone, you can use the Instagram Story template! If you’re on the computer, I have an option to click blog graphic under templates. You can also use the pinterest graphic if you can’t find it. Really, I don’t think the graphic size you select matters as long as it’s longer than it is wide. Such a helpful tutorial, thank you! thanks!!! this was so helpful thanks for uploading this post! Thanks, that is great. Would you know which covers will attract the most followers?